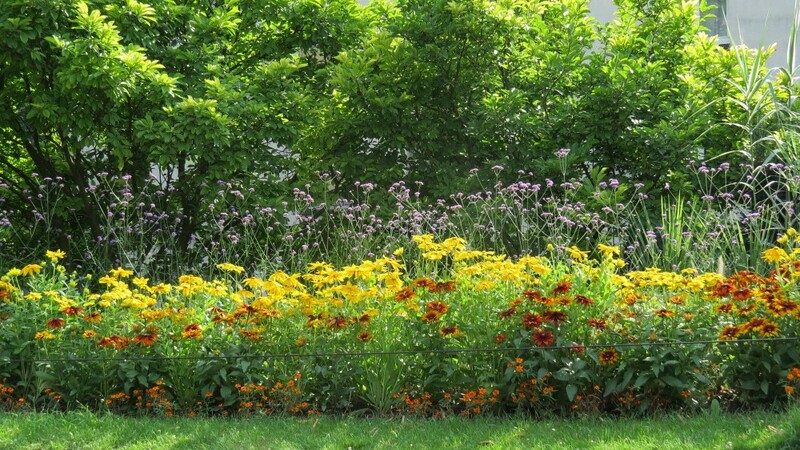 Promenade Plantee – Urban Blueprint for the 21st Century. It’s one thing to have a brilliant idea, quite another to make it happen. I spend a lot a lot of time thinking, much of it of the ‘what if’ variety but one of my many failings is that most of these ideas fall by the wayside.. So when I come across someone else’s idea that most people think is completely mad, but which with dogged perseverance and brilliant execution they make happen I have huge admiration and respect for them. Such an idea was the brilliant Promenade Plantee in Paris, forerunner of the famous and very successful Hi-Line in New York, and of several other viaduct parks and gardens. La Promenade Plantee is a relatively new elevated park in an old neighbourhood of the XII arrondisement , and I found it to be a voyage of discovery. The viaduct provides the backbone to a series of excitingly different linked gardens that unfold along the 4.7km (2.9m) route. 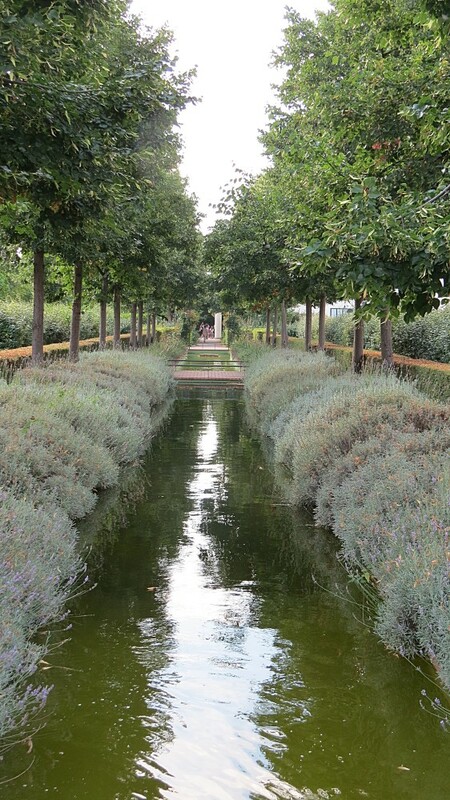 The choice of planting, hard landscaping materials and use of treillage in many forms provides continuity, whilst new elements are introduced along its length to hold the interest. It may not be beautifully planted or even well-maintained but I find it to be one of Paris’s most interesting and inspirational parks. 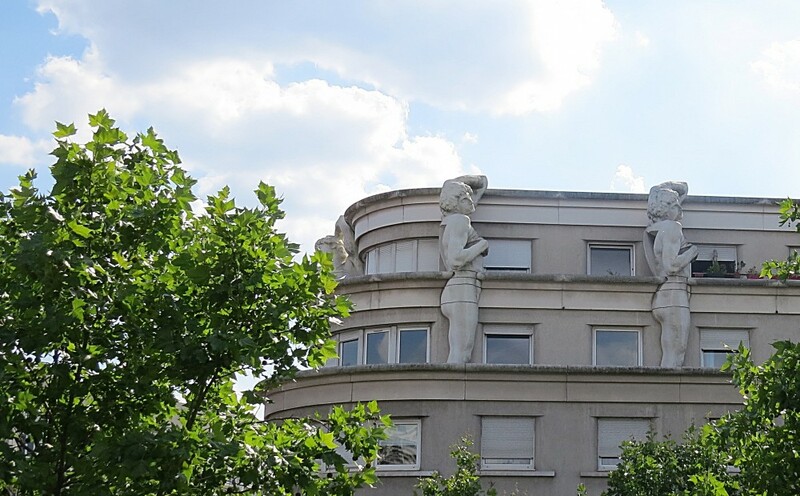 La Promenade Plantee (confusingly also known to Parisians at La Coulee Verte), was created between 1987 and 2000 on a disused railway line, starting near Opera Bastille. Running to the south-east it passes along viaducts and crosses over bridges, through archways and tight ravines between modern buildings, short tunnels and steep railway cuttings before finally coming to an abrupt halt in a busy Parisian street close to the Bois de Vincennes. 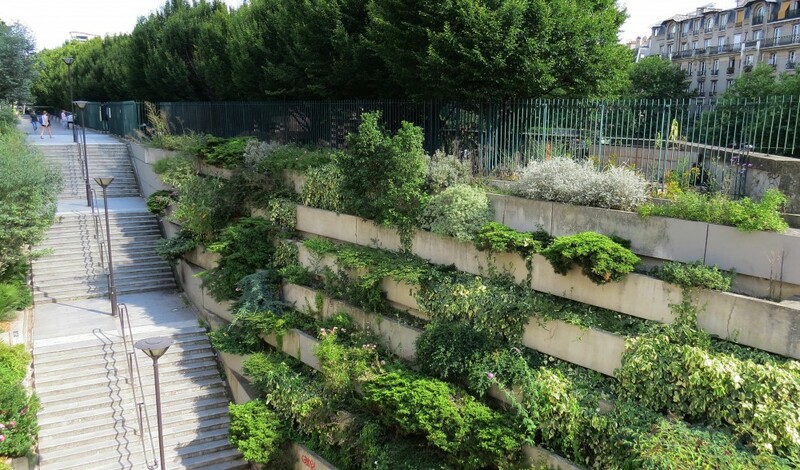 From Opera Bastille the viaduct begins with a straight section planted with an avenue of lime trees, evergreen lonicera pileata ground cover and screening hedges of laurel. At bridges, the concrete path gives way to decking, and one of the first things that struck me was the views. Instead of shop fronts, crowds and traffic noise there was a sense of openness to the sky, and calm and tranquil views of the curious and whimsical Parisian roofline. As the viaduct widens out, the path becomes bound gravel, and is able to meander through informal beds or divides and passes each side of rectangular pools. A grand flight of stairs joins the viaduct with an impressive ziggurat of planted beds. This is not a tight-fisted financially restrained project. I do admire the French approach; if you are going to do something pull out all the stops and do it well. The restored unused railway station Gare Reuilly, sits at the back of the small garden, and the promenade continues over a fine modern pedestrian suspension bridge that links small urban parks providing childrens’ play, and areas for informal ball-games, picnics and boules. 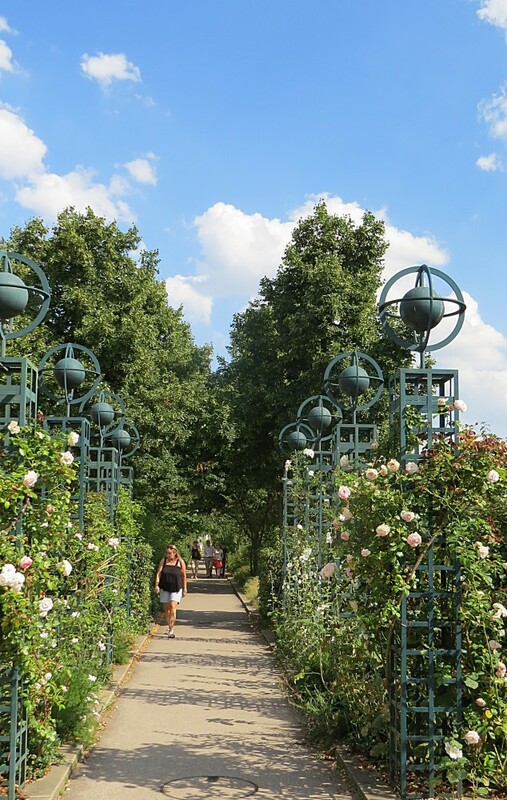 Much use is made of rose and wisteria-covered bottle green steel treillage, forming gazebos, arbours, tunnels and archways which add interest and help enliven the Promenade. Together with the curved steel seats, and the traditional kiosks this gives the park that timeless Parisian feel that I find reassuring. Only the globe standard lamp-posts seem self-consciously outdated. La Promenade Plantee is a much-used neighbourhood park, by walkers, runners and locals taking short cuts, and people just appreciating the relative calm of being a couple of storeys or so above street level. 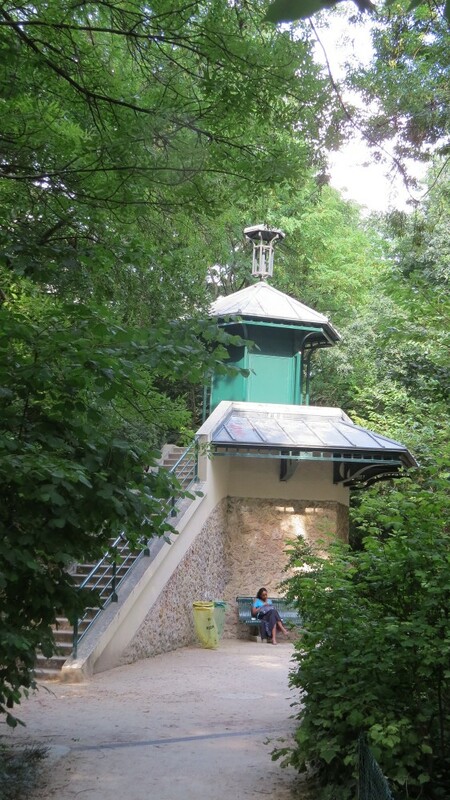 There are lots of stairs from the crossing streets but few lifts for mothers with push chairs, the elderly and the disabled; although in two sections towards the middle the viaduct descends to street level. 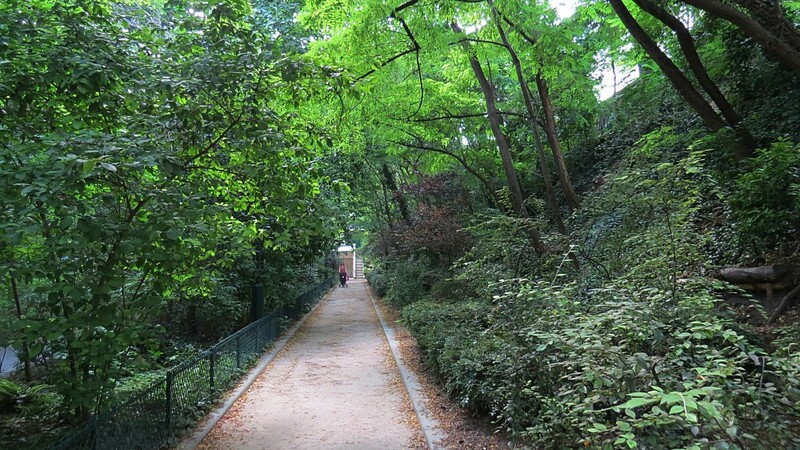 The Promenade continues through the two tunnels, opening out into former railway cuttings which have a very different feel of steep-sided natural woodland with an enclosing canopy of acacia and sycamore. 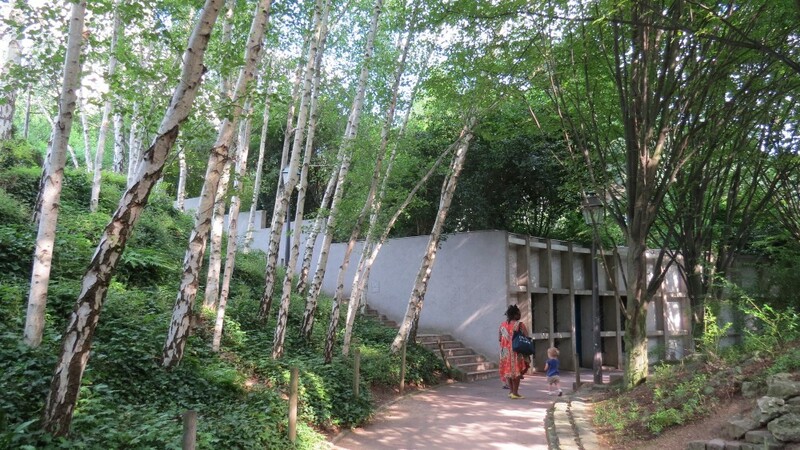 Passing through a final garden area a meandering birch grove leads down to street level. Promenade Plantee stirs my social conscience and raises my spirits. Here an uninteresting viaduct in an existing so-so neighbourhood has been turned into a valuable asset, an admirably long green linear space linking other green areas, enjoyed and well-used by the local community. As our cities become increasingly high-density we will need many more exciting and admirable Promenade Plantees.